Why are ordinary pillows Risky? Ordinary pillows can obstruct the mouth and nostrils and prevent air reaching the lungs. Even a few minutes of oxygen starvation can cause irreversible brain damage and possibly brain death (‘persistent vegetative state’). The risk is much greater during a seizure because the person affected will not be conscious enough to avoid the danger. The risk is increased if they are taking medicines that can depress breathing. How does the Anti-Suffocation Pillow Work? On the surface of the pillow there are many foam ridges that allow air to circulate around and through the entire pillow. Because the pillow is made from foam its highly unlikely the pillow will become wrapped around a childs head. What are the benfits of the Anti-Suffocation Pillow? 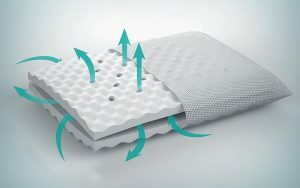 Breathability The pillows are hand-made from a special soft, highly porous foam with an open cell structure, this means that it has much greater ‘breathability’ than ordinary pillows. Profiled Surface The pillows have a gentle, rippled surface which provides a profusion of air spaces between the surface of the pillow and the micromesh cover. This means that air can pass more freely over the surface of the pillow, even when supporting the weight of a sleeping person’s head. Cervi-Shaped The pillows are subtly shaped to provide gentle support for the neck (the cervical spine). This means that the pillow supports the neck and spine in alignment, helping to maintain unobstructed breathing. Hypoallergenic No adhesives or welding chemicals are used in making of these pillows, this means that there are no volatile ‘leftovers’ to cause allergic reactions, asthma attacks or breathing difficulties. Easily Washable The pillow can be washed and dried in one piece, because the micromesh cover is permanent and doesn’t need to be removed. This means that house dust mites and airborne particles which cause allergic reactions or breathing difficulties can be washed out of the entire pillow in a single wash.
Through-Channelling Breathable air ducts are formed through the pillow. Movement Circulates Air The Aero-Cavity and Through-Channelling work together, meaning that the pillow is a ‘Dynamic’ pillow with unique advantages – any head movement pumps air from the Aero-Cavity across the Through-Channelling to pass around the head and help prevent suffocation.